Trump’s EPA plans will disproportionally hurt minorities. He’s not only cutting essential services, but the environmental justice program is on the table. 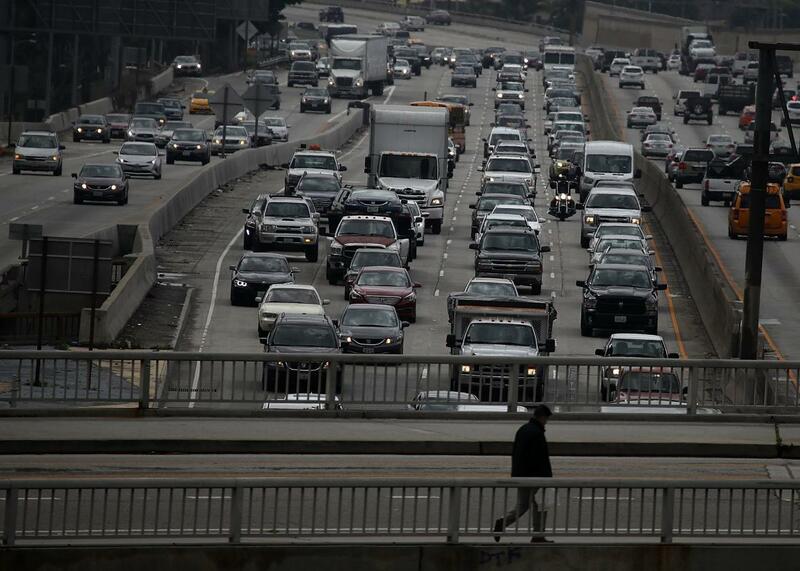 Cars travel along State Route 110 on Feb. 21 in Los Angeles. This story originally appeared on the Guardian and is reproduced here with permission via Climate Desk. Planned cuts at the Environmental Protection Agency are set to fall heaviest upon communities of color across the U.S. that already suffer disproportionately from toxic pollution, green groups have warned. Donald Trump’s administration is proposing a 25 percent reduction in the EPA’s $8.1 billion budget, eliminating nearly 3,000 jobs and several programs including the agency’s environmental justice office. Funding for the cleanup of lead, marine pollution, tribal lands, and the Great Lakes region face severe cuts, while climate initiatives are earmarked for a 70 percent budget reduction. The environmental justice office is tasked with bridging the yawning disparity in pollution experienced by black, Hispanic, and low-income communities and wealthier white neighborhoods. It provides grants to communities to mop up toxins and rehabilitate abandoned industrial facilities that are invariably found in poorer areas. In the final months of Barack Obama’s administration, the EPA unveiled a new effort to tackle lead poisoning, air pollution, and other problems suffered by communities of color situated next to waste treatment plants, smelters, and other sources of toxins. But this plan will be cut down in its infancy should the environmental justice office be dismantled. “The Trump administration has decided fence-line communities across the country, whose residents already bear an outsized burden from pollution, are on their own to take on big polluters,” said Ken Cook, president of the Environmental Working Group, an advocacy organization. “Most pollution-spewing operations are within eyeshot of the backyards and kitchen windows of African American and Hispanic families, as well as those of many largely white lower-income communities. Trump has targeted the EPA, which he has called a “disgrace,” in order to fund an increase to the military’s $600 billion budget. Scott Pruitt, the controversial new EPA administrator, has stressed that grants handed to the states—which account for around 40 percent of the EPA’s budget—should be protected, meaning the ax would fall on enforcement action, climate change initiatives, and other programs. Pruitt is also set to review the Clean Water Act, which protects Americans’ drinking water, as part of an effort to roll back environmental regulations that the Trump administration believes are stymieing economic activity. Years of urban planning decisions and sporadic regulation has led to a situation in which black children are twice as likely to have asthma as their white counterparts. Meanwhile, nearly half of America’s Latino population lives in counties that do not meet EPA air quality standards. Amid a lengthy history of such problems, community campaigners have accused the EPA of failing to respond forcefully enough. Over the past 20 years, the agency has rejected nine out of 10 complaints from communities plagued by pollution. The EPA has yet to find a business in breach of the Civil Rights Act’s Title VI provisions against discrimination on environmental grounds. The report highlighted the plight of Uniontown, a predominately black community in Alabama. The EPA allowed coal ash to be dumped in a landfill in the town in order to appease economic interests and failed to deal with years of complaints from residents who said they suffered from ailments and the odor of the waste dump, the report stated. On Thursday, the EPA also made initial steps in winding back methane emissions standards imposed by Barack Obama’s administration. The agency withdrew its request that oil and gas operators provide information on equipment and levels of methane, a powerful greenhouse gas, emitted during drilling operations. The move follows complaints from nine states that the request was too onerous on businesses. “By taking this step, EPA is signaling that we take these concerns seriously and are committed to strengthening our partnership with the states,” said Pruitt.